Having a large family, means that I’ve had more than my fair share of babies and and all the experiences that they bring. I loved every moment of time spent with each one of them at pretty much every stage of development. 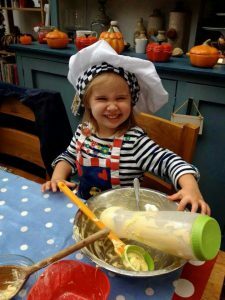 The odd sleepless night comes back to haunt me every so often, but on the whole, the early years of hands on baby care and toddler activity are happy and pleasant memories indeed. Now, with my youngest well and truly settled into secondary school, those days are almost distant memories. The baby, who can no longer be referred to as the baby of the family, gives me a stern look and a little talking to if I dare to mention ‘the baby’ words! During house moves and bedroom makeovers during the past few years the amount of toddler clutter has gradually diminished. Bagged up and stored for a while before I eventually succumb and resort to reluctantly giving them away. With each bag of jigsaws and Lego, Barbie dolls and Action men that left our family, went a large chunk of Fearn childhood. I’m far too sentimental, but also far too practical to keep boxes full of unused toys. We will always have the memories and hundreds of photos to bring back those happy toddler days. More importantly, we now need the space to store all the gadgets and belongings that teenagers seem to collect. The digital gadgetry, the sports equipment, the art materials, the musical instruments, the list is endless but the space is not! Family life is never dull, and is always filled with memories in the making, so different now to ten years ago, but equally as fulfilling and exciting. The plastic toys in blue and pink may have been replaced by monochrome and metal, the fiddly boxes filled with tiny pieces may have been replaced by substantial items, and the small costs replaced by hefty price tags, it’s a different kind of family life! Some special toys however, never made the recycle pile and on Saturday they were washed dried and enjoyed all over again. Just in case any rumours get stated, there are no grand children, not yet, I think they’re a long way off! 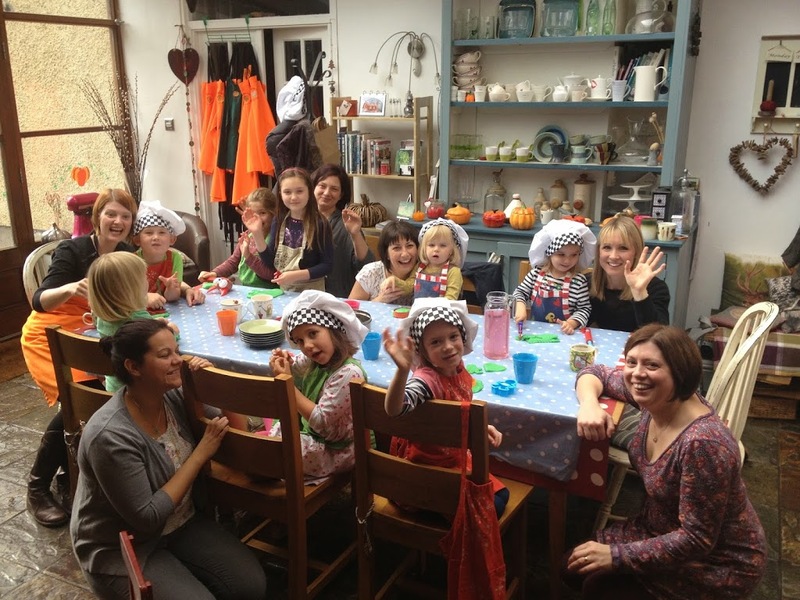 Saturday was the first ‘Little Pumpkins’ cookery class, for little children under the age of six. The boxes of blocks and traditional toys that I’d managed to save were put to good use once again.The little tables and chairs were used, and I even made another batch of home made play dough, though I have to confess, I had to check the recipe!! The look of total enjoyment on their little faces as they mixed and folded and made their very own batch of cup cakes with their Mum was delightful. The morning wouldn’t have been complete without a play time, so as they put my home made play dough and toys to work, the Mums enjoyed a slice of freshly drizzled lemon cake and coffee (well, we had to do something whilst the cakes were baked!) Once cooled, the cakes were transformed into a flock of Towy sheep, complete with little tails! It was a happy morning, no squabbles, no mishaps, just baking. It’s not difficult to decorate the cup cakes and they really do look great. 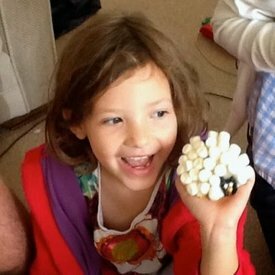 Perfect for a child’s party or sleepover activity, or just for fun on a wet afternoon.